Major international, interdisciplinary research programmes are now underway to increase our understanding of how the Earth System operates and how it is changing through the effects of human activities. Although understanding and predictive capacity are still limited, scientists already agree that significant global changes must be expected in the next 50 years that will affect the capacity of the Earth to sustain life. Governments, business and industry have, therefore, come to recognize that scientific knowledge about the changing global environment - as yet incomplete but rapidly evolving - is becoming indispensable for wise long-term policy making, the goal being to design preventive, adaptive and remedial measures. Thus global change science and policy making are engaged in a process of forming a new partnership that is taking shape as further insights evolve. Effective continuous interactions between the partners requires mutual understanding: decision-makers need to understand the unique potential but also the limitations of the results of scientific research in progress while scientists must take into account the priorities and constraints of policy-makers in designing and implementing policies that will promote long-term sustainability of life on this planet. 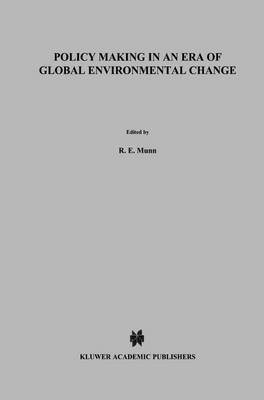 This book contributes in a unique manner to this mutual understanding: It gives an overview of the ongoing relevant research focusing on the two major international programmes, the International Geosphere-Biosphere Programme and the World Climate Research Programme. These are described in terms understandable to the interested lay reader. The results of the latest review of the Intergovernmental Panel on Climate Change (IPCC) are included. This is followed by an analysis of the response process that is in progress with respect to governments - singly and multilaterally - by business and industry and by public interest groups. This process is leading to interactive structures, assessment procedures and legislation, nationally and internationally. Business and industry are changing from mere watchfulness to recognition of new opportunities for products and processes. Six interviews with prominent figures from business and government circles in the Netherlands provide a vivid illustration of the questions at issue. The appendices provide overviews of methods for incorporating the results of global change science into policy-making and development of long lasting projects. Adaptation to climate change serves as an example. Thus, for the first time, one book describes both ongoing research work in global change and the response processes that the research results are evoking. It is of interest to all stake-holders in the scientific community as well as to decision-makers in industry, business and government.